The U.S. women's hockey team spoke about its thrilling 3-2 win in a shootout over Canada to win gold and needing 'just one more' save by goalie Maddie Rooney. The "Miracle on Ice" now has a sequel. The U.S. women's hockey team wrote their own chapter in Olympic lore in Pyeongchang on Thursday when they beat archrival Canada in a heart-stopping shootout for a 3-2 win in the championship game. The team joined Hoda Kotb and Savannah Guthrie on TODAY Thursday as they basked in the the glow of a classic victory. 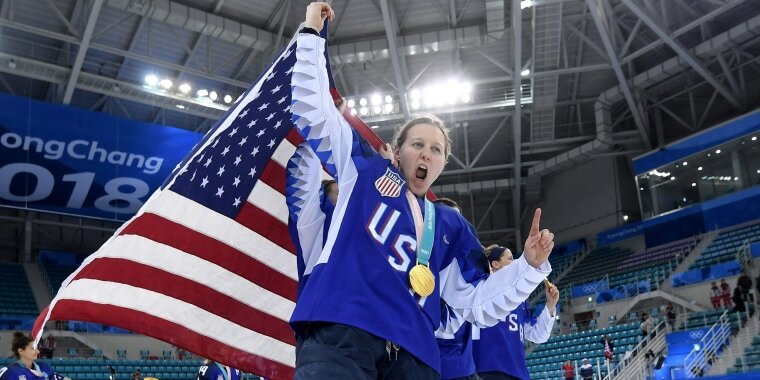 The win came down to 20-year-old goalie Maddie Rooney stopping a shot to seal Team USA's first gold medal in 20 years. "I kind of was just looking over at the bench (during the shootout) and seeing all of them pointing at me and just saying, 'One more,' and we're gold medalists," Rooney said about her winning save. "It was totally a blur. That celebration, everyone just sprinting at me, it was an indescribable feeling." Thursday marked 38 years to the day of the original "Miracle on Ice," when the U.S. men's hockey team shocked Russia in the medal round at the 1980 Olympics in Lake Placid on their way to winning gold. The women were asked if the win over Canada measured up as their own "Miracle on Ice" moment. "Let's call it that,'' captain Meghan Duggan said as her teammates cheered. It marked the first U.S. gold medal in women's hockey since the sport was introduced to the Olympics in Nagano in 1998. It also helped erase the memory of an overtime loss to Canada in the gold medal game in Sochi in 2014. Team USA trailed 2-1 after a pair of unanswered goals by Canada. In the third period, Monique Lamoureux-Morando finished off a breakaway to tie it and force overtime. "It honestly just leaves me speechless in how we won ... I feel bad for our parents and the stress we put them through,'' Lamoureux-Morando said on TODAY. "It brings tears to my eyes." Following a scoreless overtime, Lamoureux-Morando's twin sister, Jocelyne, scored off an amazing deke move in the sixth round of the shootout to put the U.S. in position to win. Rooney then thwarted a shot by Meghan Agosta to set off the celebration. "We had it,'' Duggan said. "I looked up at the Jumbotron (before the shootout), Maddie was smiling, and we're like, 'Alright, our goalie's good.' We knew we had it within us, and we were ready to go. I knew it was ours." Angela Ruggiero, a member of the 1998 gold medal team, was in Pyeongchang to drape the gold medals around the players' necks. "You have Angela Ruggiero giving us our gold medals, and how it all just came full circle 20 years later, I don't think it's a coincidence," Monique Lamoureux-Morando said.